Home » Fly Fishing » Happy New Year! First up, Happy New Year everyone! I hope that 2011 sees a great year for all with many rod benders! My normal New Year celebrations involve some sort of party on Hogmanay (That’s what we call it in Scotland!) This year was to be quite similar but rather than a party it was a bit of a bar crawl before joining the crowd at the midnight fireworks and then heading back to the bars. Queenstown does have a pretty reasonable New Year celebration, not quite like Scotland but not bad at all. My friend Niall was with me so I had decided on a lake I have fished before as it has easy casting, clear water and fish cruising the margins which are easy to spot. Well it does when there hasn’t been a rather wet period and the water level hasn’t risen a couple of feet and coloured since last time – bugger. To top it off, whilst sitting in the car as close to the lake edge as “reasonable” an english chap proceeded to drive in front of us, parking sideways, around 4′ away from my car, blocking the entire view and then set up his and his family’s fishing gear without a word to me. He can’t have missed my rod, bag and net sitting outside the back of the car… The first stranger I got to meet in 2011 was in fact a complete prick, great start eh? At least my plans (and Plan-Bs) of late have been of a calibre that would make Hannibal Smith proud! So a quick rack around my brains for a location, a quick think about how to sell my fishing trip as something a bit more appealing to my friend and it was done. 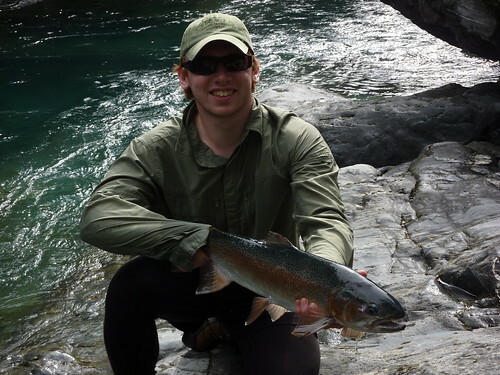 A two/three day hiking trip up a very scenic river valley that just happens to have some of the most spectacular fishing in the world. A quick packing of the rucksacks and 9km later saw us bump into a Department of Conservation warden who informed us that a weather warning was out warning of 250-300mm of rainfall possible from midnight on the 2nd until the 3rd. Ok, we’ll cut the trip to today, camp, tomorrow and hike out before the rain comes. We hiked on a bit, pitched our tents in a nice high spot in case of any imminent monsoon and set off to work on the river. First sighting of the river revealed a trout of around 2lb sitting doggo, perpendicular to the current. Not sure if he was sick, pissed off at being caught or just a bit bored but I couldn’t work out what he was upto; his attitude indicated he wasn’t worth a cast. A few feet further upstream and the first feeding fish was spotted and then another; both nice fish of a couple of pounds. A wee bit further upstream and the big boys were spotted – some serious fish feeding away in a near perfect place; if it wasn’t for the tricky casting position, the myriad of currents and the fading light. Never one to squander such a grand opportunity, I attempted to pick off one of the smaller fish first. This was half successful, half because the fish did come up and take the dry yet some eejit missed it! After an acceptable level of swear words had left my mouth, it was onto the first big fish. 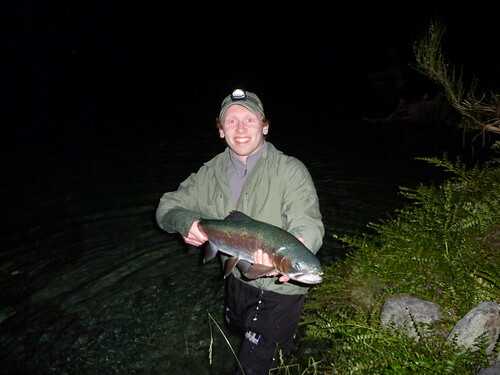 For this one I wasn’t going to mess around battling the current and difficult casting position, so it was 50m back downstream, a bollock deep wade across the river in which the water felt hardly above freezing at 10pm. I sneaked up the far bank, crouched behind a fallen tree and popped a cast around the side of it. This time I had a nice uniform current between me and the fish. I saw the rise, tightened and hung on as the fish bore straight down! The pool they were holding in was at least 20′ deep, likely more. The result was a nice fish, not one of the big ones I was actually targeting, not sure if he was maybe lying just off to the side of the large fish spotted, who knows? 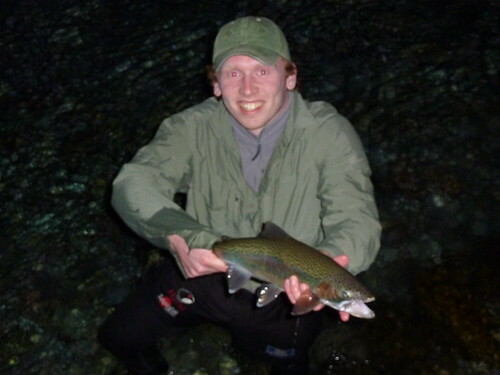 I decided to give my friend Niall the next cast and his first cast in New Zealand hooked into this fine rainbow. 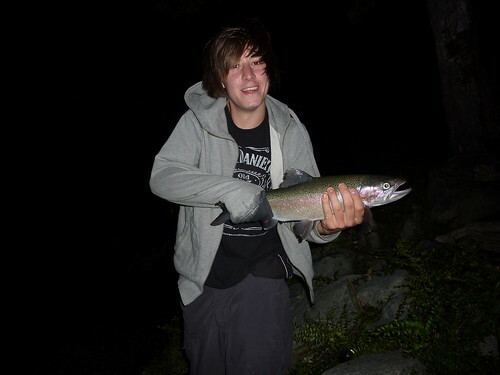 The way in which this fish fought, it could easily have been mistaken for a fish twice as large. I didn’t fish to this fish as there was a larger one in front of it that I had my eye on, it was lying deep though; feeding but deep. The only way I was getting down to it was a large streamer, tungsten cone and leaded. A purple zonker with a brown glister body inspired by Chris Dore’s Mr Glister. 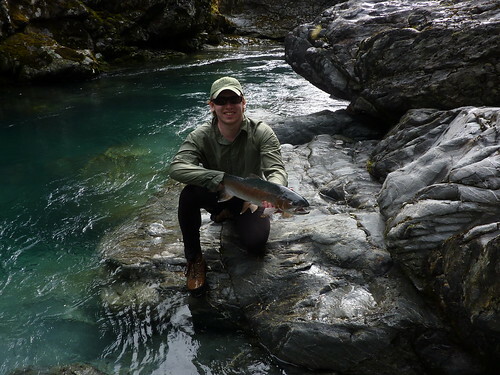 I crawled around the rock ledge, keeping out of sight, somehow managed the exact cast I wanted, around the corner and upstream and the fish took hold as the streamer fluttered down past him. 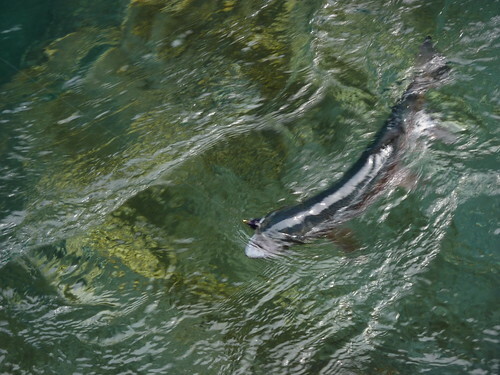 A large magnum zonker strip on a large streamer has an amazing action! This fly was around 2 1/4” long.e A magnificent fish was captured after an equally magnificent fight. 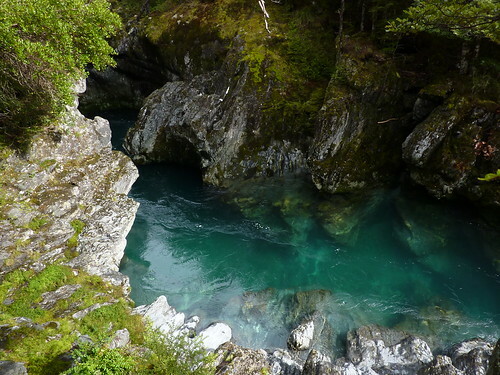 The fish was holding in the top of this pool, I was casting seated on the rock ledge on the left just above the water, making a cast around the rock and upstream between the sides of the gorge. 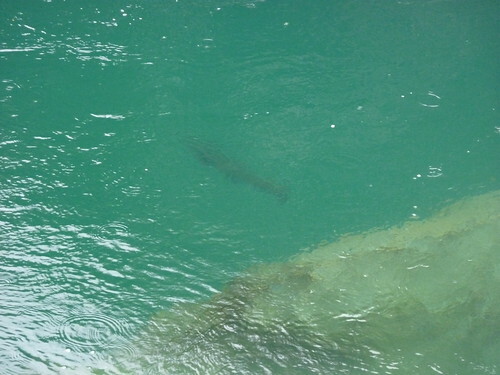 The fish was directly underneath me out of view. That was the last fishing for this trip. 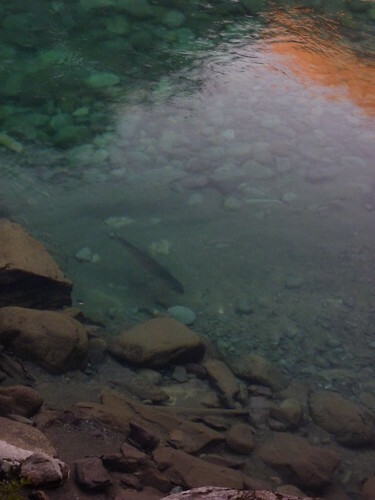 We hiked more of the track, saw some more fish (large ones too!) but I didn’t feel the need to get down and fish for them. I hate not catching fish, I go fishing to catch fish but in this instance the 4 fish landed had me totally content. My New Year was a different one to normal but exceptional; I had three fantastic fish and managed to get Niall into a fish too. I am starting to feel some sort of enlightenment happening, not in the sense of dramatically changed outlook on life but learning and understanding the fish environment more. Too often I think I have thought to myself I need to magically learn this and that or read this book. I don’t. I have to get out there and do it and I feel I am reaping the rewards of that. Yes, I have received great pointers from friends and books but the end result, I feel, is a product of my experience, my adaptation and my execution of a set of actions. I believe I can state what you need, at least in part, to catch big fish; and it isn’t that complicated. 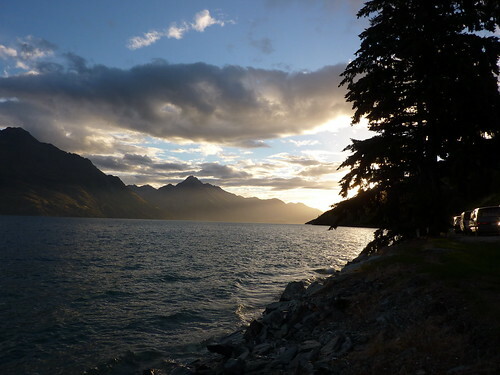 It is to simply know where big fish live, present your flies perfectly and have that element of luck that dictates what mood the fish is actually in. When I say present perfectly, I don’t mean pretty good, I mean perfect. It’s amazing the difference in reaction from the fish. I’m heading away for the next few weeks to hike the Abel Tasman coastal track again and then fishing for a week or two afterward. Hopefully there will be more fish to report!